There’s an old adage among e-smokers: the less an e-cigarette looks like a real cigarette, they say, the better it works. I think that’s oversimplifying things, but you can’t deny that a larger e-cigarette holds more liquid, gives you better battery life and often generates more vapor per puff than a smaller one. A lot of people start with smaller e-cigarettes like the Envy Nirvana — which is great — but if you like e-smoking, you may soon find yourself wondering what you can do to get better performance. If you’re like me, you step up to the Envy Ego-Tank. 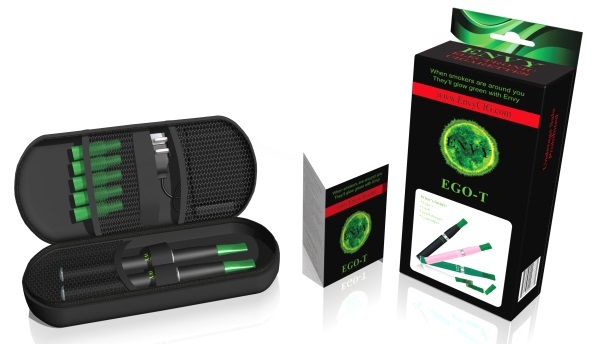 I’ve tried a number of different eGo e-cigarettes in my time writing about the e-cigarette industry and believe that none of them can beat the Envy Ego-Tank for sheer value. Thanks for stopping by! This is a fairly old product now. Why not take a look at my list of the best e-cigarettes of 2016 instead? The Envy Ego-Tank is available in two different kits, with the less expensive one including one short 650 mAh battery, one tank atomizer, USB and wall chargers and ten pre-filled tanks. The more expensive kit adds an extra 1000 mAh battery and an extra tank atomizer, plus both kits include a nice protective carrying case. You can choose between Envy’s Tobacco and Menthol flavors for your pre-filled cartridges, and because each cartridge holds a little over 1 ml of liquid, you can expect your initial supply of liquid to last two weeks or more. That’s an important feature if you’re a new e-smoker because it ensures that you’ll have plenty of time to decide if e-smoking is for you before you’ll have to buy refills. The Envy Ego-Tank has three parts that work together to produce vapor. The first is the battery, which is activated by a small round button on the side. The second is the tank atomizer, a small cone-shaped device that screws into threading at the top of the battery. The last part is the tank that holds the liquid. With your initial batch of pre-filled tanks, you’ll use the Envy Ego-Tank by screwing the tank atomizer into the battery, removing a tank from the plastic wrap and pushing it straight down into the opening at the top of the tank atomizer. When the tank is pushed in fully, the tank atomizer punches a hole in the tank’s silicone cap so e-liquid can flow to the heating coil. The rest of the silicone cap remains in place to prevent leaks. Just hold the button on the battery down when you want to puff on your e-cigarette. For most people, one of the pre-filled tanks included with the Envy Ego-Tank is good for around a day or more of e-smoking as each one gives you about the same nicotine as a pack of cigarettes. So, by the end of your first week, you’ll need to start thinking about buying refill liquid so you’ll receive your shipment before your initial supply runs out. Envy sells packs of five pre-filled Ego-Tank cartridges at $14.95 each. Alternatively, you can fill your own tanks. Envy sells e-liquid at $12.95 per 10 ml bottle and has several flavors available. You might also consider checking out my list of the best e-liquid companies, but remember that you’ll need to buy your empty tanks from Envy to ensure that your Ego-Tank works properly. Empty tanks cost $4.50 per five-pack. You can fill a tank many times before you’ll need to think about replacing it, though. The reason why I like the Envy Ego-Tank Premium kit — in addition to the fact that it includes two batteries rather than one — is the fact that it includes two tank atomizers. Since the tank atomizer is the component that creates vapor, it’s absolutely essential that you have a working one at all times. The heating coil in your tank atomizer will eventually go bad after around two months or so. Buying the Premium Kit gives you a spare atomizer, and since Envy charges $12.95 for replacement atomizers, purchasing the Premium Kit essentially means that you’re getting the 1000 mAh battery for free. The Envy Ego-Tank is so incredibly inexpensive and offers so much for so little that I have trouble thinking of who I wouldn’t recommend it to. If you’ve tried e-cigarettes and are ready to step up to something that offers more vapor, better battery life and more e-liquid per refill, the Ego Tank is ideal. 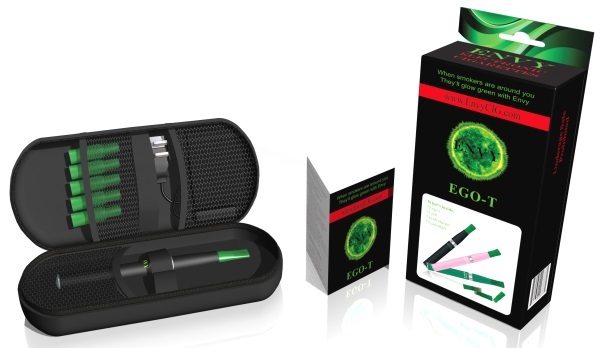 Don’t discount the Ego-Tank if you’ve never tried an e-cigarette before, either; although some e-cigarettes such as the Envy NirVana are great values and cost even less, the Envy Ego-Tank is a great package for heavier smokers who may not get enough nicotine out of a smaller e-cigarette to fully satisfy cravings. Click to see the Envy Ego-Tank now.